Mari0 is Mario Bros mixed with the popular puzzle platformer Portal. It's an indie game from stabyourself and you can download it has a version for linux, Windows and Mac OS X. 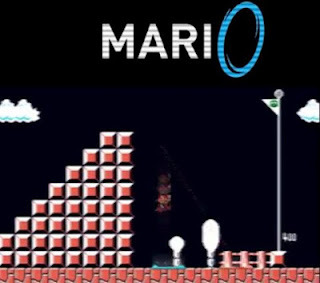 This game pretty much explains what will happen if you give Mario a portal gun. What's great in this crossover game is it lets you play through custom stages based on Portal's levels as well as create your own stages using level editor. Mixing games with one another gives players a new kind of gameplay but it sometimes it also gives more challenge. In Mari0's case, it is the control scheme that makes it hard. Moving Mario plus aiming and shooting a portal gun is really handful. Other than that, it's a great Mario slash Portal game! Meanwhile, I collect Mari0 walkthrough so you don't have to.